Even though during the pioneer days of American expansion the western migration focused on California, Oregon and Washington, those States have now been surpassed by Idaho as the best Western State in which to homestead. The situation in California, Oregon and Washington has changed and they are no longer high on the list of places to consider when desiring a modern homestead in the American West. The reasons why Idaho is the best western State in which to homestead include: More water availability than many Western States, Homestead friendly State, Varied choice of locations, Low incidence of destructive weather patterns, Low population density, Freedom friendly State and Abundant natural beauty. We live on a homestead in the mountains of north Idaho some 50 miles from the Canadian border. We made a cross country move from a State east of the Mississippi River to Idaho in the fall of 2003. We had both lived in the west prior to our marriage and both of us had a desire to move back to the American West. Let me share the reasons why Idaho is the best Western State in which to homestead. A modern homestead lives and dies on the availability of water. Without water crops and livestock die. If there is a low water or no water situation long enough there is the possibility of the homestead looking like the "dust bowl" of the American Mid-West in the 1930s. No serious homesteader wants to live in an American dust bowl. North Idaho, from the town of St. Maries, pronounced St. Mary's, north has several large lakes. The southern most lake is Lake Couer d' Alene which stretches from near St. Maries up to Couer d' Alene. This lake is the second largest lake in northern Idaho. It is 25 miles long, 1 to 3 miles wide and has some 109 miles of shoreline. Lake Pend Oreille is above Interstate 90 and is the largest lake in Idaho. It is 43 miles long with a surface area of 148 square miles and 111 miles of shoreline. This makes it the 38th largest lake in the U.S. It is 1,158 feet deep making it the 5th deepest lake in the U.S. The northern most lake in Idaho is Priest Lake. Its northern end is within 15 miles of Canada. It is actually 2 lakes connected by a 2 1/2 mile channel that traverses some of the most spectacular forest scenery in America. This channel, called the "Thoroughfare," is protected from any type of development and is a "no wake" area that's perfect for canoeists and kayakers. The northern most lake, Upper Priest Lake is much smaller than Priest Lake which is 19 miles long and over 300 feet deep. In addition, Idaho has a good amount of rivers coming down from and around the mountains. In many portions of the State there are springs flowing from the mountain sides. The northern and central portions of Idaho have many smaller lakes as well. The western U.S. is generally more arid than the eastern U.S. Like most western States Idaho has portions that get considerably more rainfall in a year than other parts of the State. In eastern Idaho in about the middle of the State is the town of Salmon, Idaho with an elevation above sea level of 3,944 feet. It has an average rainfall of only 10.21 inches/year. By contrast, almost 112 miles as the crow flies, due west of Salmon in western Idaho, is the small town of McCall, Idaho. McCall is located at an elevation of 5,013 feet above sea level. McCall averages 27.21 inches of rain/year. Why the marked difference in rainfall for towns located on about the same Latitude? The answer is to a large part due to the effect of mountains on rainfall. In Idaho, as in much of the American West, the prevailing winds are from the west. As moist air currents from the west flow up the mountain sides they meet cooler air which precipitates the moisture as rain falling on the western side of the mountains. Once the clouds pass over the peak of the mountains there is much less moisture to precipitate out as rain. McCall's elevation is a few hundred feet lower than the mountains between McCall and Salmon. This results in the bulk of the moisture in the clouds falling as rain before the clouds pass over the mountains between McCall and Salmon. So when the clouds reach Salmon there is not a lot of moisture left in them to produce rain. As you go further north above McCall on the west side of Idaho you come to Idaho's largest County, Idaho County, and the city of Grangeville. Grangeville averages 23.5 inches of rain/year. Above Grangeville is the town of Orofino which averages 26.59 inches of rain/year. In northern Idaho the average rainfall for three northern cities is: Bonner's Ferry 21.5 inches/year, Sandpoint 31.9 inches/year and St. Maries 28.17 inches/year. I have read several articles where it is stated that to raise crops on a homestead in Idaho you need to be in southern Idaho for the longer growing season. Those statements are absolutely false. As can be seen from the above list of cities there is more rainfall and moisture in central and north Idaho than in southern Idaho. On our homestead we extend the growing season by using a hoop house style greenhouse which costs around $300 for it's 10' by 32' size. This is much less expensive than having an irrigation system. Besides that, we regularly are harvesting ever bearing strawberries, blackberries, raspberries, beans and tomatoes grown outside of the hoop house style greenhouse all through September and often into the month of October. We are located above I-90 and around 50 miles as the crow flies from Canada! By the term "homestead friendly State" I mean a place where homesteaders can homeschool their children, have reasonable exemptions for those who do not want their children to be required to be vaccinated, and find good areas conducive to a homestead lifestyle. A homestead lifestyle includes the idea of being self-sustaining with a minimal need of depending upon public utilities and stores for everyday necessities. Traditionally the homestead life was one of growing, producing on the homestead, or hunting and fishing most necessities. There was an occasional trip to the nearest general store for provisions such as salt and sugar and to the blacksmith shop for repairs to tools and implements. A modern homestead is still a place where the homesteader becomes as self-sustaining as they desire to be. But most homesteaders today depend upon gas, oil and diesel fuel for homestead implements and many utilize solar, wind or hydro power for the production of electricity. Another mark of a homestead friendly State is a State where there is a Homestead Exemption protecting a portion of the homestead's value from creditors. Idaho has a liberal Homestead Exemption where under the statute $100,000 worth of property, (land, primary residence home or mobile home, improvements), are exempted from creditors. The Idaho Homestead Exemption also reduces the value used to determine property taxes by 50% of the home, up to one acre of land up to a maximum amount determined by the State legislature. This exemption is available to all property owners on their primary residence. If you desire to homestead in a desert area, you will find that in the Southern portion of Idaho. From south of a line running roughly from Rexburg in the east to Boise in the west the predominate landscape is desert like. If you want prairie then there are areas of the Palouse which is around Moscow and Lewiston and extends into eastern Washington. This area got its name from French-Canadian fur traders who used the French word pelouse which means "land with short grass." Eventually the spelling changed to Palouse. A portion of the Palouse near Lewiston is also called the Camas Prairie. Other than the Palouse, the area from about McCall north to the Canadian border is both the most scenic portion of Idaho and the area of mountains, valleys and benches on mountainsides which make good homestead areas. This means there is a good variety of desert areas, prairie areas and mountain areas to choose from to homestead on in Idaho. There are occasional tornadoes in southeastern Idaho. Usually spawned by unusual thunderstorms. But nothing like the tornadoes in the American mid-west and portions of the American south. Idaho has had no hurricanes or hurricane force storms according to https://www.homefacts.com/hurricanes/Idaho.html. Idaho has, like many States, had occasional incidences of straight line winds which have the potential to take down trees or damage roofs. Low lying areas in southern Idaho are the predominate areas that could have flooding. On occasion there has been flooding in other areas of Idaho. There are 2 areas in Idaho that are at fair risk for earthquakes. One is in the central Idaho mountains about 80 miles above Boise. The other is in the South east portion of Idaho near the northern Utah border and associated with the Yellowstone Hot Spot in Wyoming. Much of Idaho is snow area. Even in wintertime in the southern Idaho desert regions. There can be heavy snow fall and there is the possibility of a blizzard. This is the same possibility that exists in much of the northern half of the American West. It is a possibility that is to be prepared for so when and if it occurs, you are prepared to handle it without problems. The most prevalent danger in Idaho is not really a weather pattern. It is the possibility of wildfires. There is a fire season every year and times when a "no burn" order is in effect. This wildfire danger is common throughout the American West. There are methods of land management that can reduce your chances of wildfire damage. A low population density means there are fewer people to use the State's natural resources such as land and water. Land and water are two primary resources that are valuable to homesteaders. The more land and water available the more success a homesteader can expect. In size Idaho is the 14th largest State. In population density Idaho is the 12th least populated State. This works out to Idaho being the 7th least densely populated State. Of the six States that are less densely populated than Idaho, (New Mexico, South Dakota, North Dakota, Montana, Wyoming and Alaska), none of those States come close to having the amount of usable homestead land with a good source and quantity of water as Idaho has. There are potential homestead areas in each of those six states but not the level of homestead areas with both good land and water that are found in Idaho. We will take a brief look at each category and then briefly compare Idaho to the rest of the U.S.
All States have regulations and zoning affecting land usage. Idaho has regulations also. But a much larger percentage of land in Idaho is zoned agricultural/residential and can be used for homestead purposes. Many States have regulations about such things as home burials. Rural Idaho Counties usually do not. The County may request that home burials be conducted with a casket and a vault to prevent contamination of nearby water sources. Many Idaho Counties allow homes on 5 acre plots and some on less acreage. Even in Counties with a 5 acre requirement it is possible to get a variance from planning and zoning for a house on less than 5 acres. Some Western U.S. States are plagued by the State Supreme Court Legislating from the bench. In those States where this is commonplace the State Supreme Court Justices make rulings that restrict a landowners right to drill a well, have a septic system installed or limits their ability to use their land for a safe and reasonable purpose. Idaho's Supreme Court has not done this. It is the purpose of the State Legislature to "legislate," to make and pass laws governing areas such as land usage. It is the purpose of a State Court System to uphold those laws passed by the State legislature and to see that both the State and Federal Constitutions are upheld in the laws passed by the State legislature and in regulations - the lowest form of law - passed by a County or other governmental entity in the State. Regardless of the argument a State Supreme Court makes when it legislates from the bench, most of the legislation from the bench ends up creating problems for the citizens instead of rectifying problems. Only one other State, Wyoming, has a lower government debt ratio than Idaho. What this means is that only Wyoming has a lower ratio of debt to the State's usual sources of revenue or income/year than Idaho. This speaks well for Idaho's fiscal management. The intent of including this fact about Idaho is not to engage in a discussion about the pros and cons of vaccinations for children or whether children should be vaccinated. Those discussions are better carried out in other forums or with trusted medical advisors of the parents choice. Childhood vaccinations is a topic that is of vital importance to many homestead families. Idaho does not mandate childhood vaccinations and has exemptions available for both medical and Religious reasons. One measure of the personal freedom a State allows is its homeschool regulations. Although our children are grown and have families of their own, we experienced both homeschooling and sending our children to private schools for their education. I know of several families who chose Idaho as a State to Homestead in because it's homeschool regulations allowed them the freedom to design their children's education to include homestead activities as well as the traditional school curriculum. This is accomplished without the hassle some States or County educational systems subject homeschooling parents too. Like all States, Idaho has a set of laws designed to safeguard society and the rights of others. The basis for these laws is an understanding that each person is responsible for their words and actions. This is a concept that should be easily understood by those who homestead or want to become homesteaders. Personal freedom means that as long as a person does not infringe upon the freedoms of those around him, he is responsible for what he does, says and the consequences of those words and actions. Personal freedom and responsibility can be expressed by a saying I first heard many years ago: "My freedom ends where your nose begins and your freedom ends where my nose begins." Mature responsible people realize that all people "are endowed by their Creator with certain unalienable rights and among them are life, liberty and the pursuit of happiness." (From the U.S. Declaration of Independence). When someone believes or acts like they have freedoms that those around them do not have that person is on a course to run afoul of those laws designed for the safeguard of society and the rights of others. In contrast to several other States in the U.S. Idaho does not take the role of a "Nanny State" by passing a multitude of laws or regulations designed to control every aspect of a person's life. This is not meant to be a political statement but a statement of practicality. The largest wilderness area in the "lower 48 States" is in Idaho. Additionally Idaho has large tracts of both State and Federal Land that a homestead can border. This means there is the very real possibility of an encounter with wild animals such as mountain lions (also called cougars, panthers or pumas). We have had Moose within 50 feet of our house and a few years ago even a yearling black bear wandered into our yard. We hear coyotes yapping on a regular basis on summer evenings and have on occasion seen a fox. Deer and Elk are no strangers to our area. We have not seen a wolf around our homestead but they have been sighted a few miles away and have killed small livestock such as goats. We know folks who have lived in this area pretty much all their lives and have not had an encounter with a dangerous wild animal. Nevertheless, it is comforting to know that Idaho does not have restrictive laws on firearm ownership. We see several who open carry firearms and one prime reason is for protection against wild animals in rural areas. Idaho Is The Freest Western State In The U.S. The Mercatus Center at George Mason University rates Idaho as the fourth freest State in America. Idaho ranks ahead of it's nearest western competitor, Nevada, which tied for 5th freest State in America. One area not mentioned above that Idaho excels in according to the Mercatus Center include few restrictions on motorists other than secondary seat belt laws and an open-container law. The Mercatus Center also gives Idaho high marks for its homeschool policy. There are no regulations on homeschooling other than curriculum requirements. In this article's section on More Water Availability Than Many Western States (above) the annual rainfall of several Idaho areas was compared. In this section we will look at the average annual snowfall and temperature of those same areas. This will give an idea of the potential length of growing season in those areas. However, please be aware that it is more than just the average months with no freezing temperatures that determines the length of the growing season. As an example, the growing season cannot start until the ground warms up sufficiently to allow for seeds planted to germinate before the plants can grow. Another factor is the phenomena called micro-climates. Idaho Falls has average temperatures ranging from 38 to 86 F from May through September. The only month that has not had temperatures below freezing is July. Average rainfall is 14.21 inches. Meridian's average temperatures range from 39 to 91 F for the months of April through October. There have been record low temperatures below freezing in every month except July and August. In the winter there can be light snowfall. Irrigation districts serve Meridian and the area with water needed for crops. Average rainfall is 11.77 inches. Mountain Home's average temperature ranges from 35 to 92 F for the months of April through October. The winters are short but cold and summers are dry. Mountain Home is at 3,146 feet elevation and Mountain Home Air Force Base is 12 miles SW of the town. Average rainfall is 10.57 inches. Rexburg's average temperature ranges from 38 to 84.3 F from May through September. The average annual snowfall is 54.6 inches and there have been temperatures below freezing in every month of the year. Average rainfall is 13.3 inches. Twin Falls has average temperatures ranging from 33.7 to 85 F from April through October. There have been temperatures below freezing in every month except July and August. Average annual snowfall is 29.5 inches. Average rainfall is 10.99 inches. Grangeville's average temperature ranges from 33.5 to 82.1 F from April through October. There have been temperatures below freezing in every month except August. Snowfall averages 52.7 inches a year. Average rainfall is 23.5 inches. McCall's average temperature ranges from 33.2 to 80.1 F from May through September. McCall is at 5,013 feet in elevation and has some of the highest snowfall in Idaho averaging 134.2 inches a year. Because of the elevation the temperature may drop below freezing in any month of the year. Average rainfall is 27.21 inches. Orofino's average temperature ranges from 36.4 to 90.2 from April through October. For the months of June, July and August the temperature does not drop below freezing. Because of Orofino's low elevation of only 1,030 feet it has some of the hottest summers and mildest winters in the State. The hottest temperature recorded in Idaho, 118 F, was recorded in Orofino July 28, 1934. The average annual rainfall is 26.59 inches. Orofino is on the northern bank of the Clearwater River and climate wise has more rainfall and a longer period of time when there is no record of temperatures below freezing than the above cities in the southern Idaho desert. Orofino is on the northern end of Central Idaho and has a much prettier landscape, more rainfall and potentially better weather for homesteading than the southern Idaho desert has. Salmon's average temperature ranges from 39.5 to 87.3 F from May through September. Salmon has an elevation of 3,944 feet and an average rainfall of only 10.12 inches. Because of the elevation you can expect the chance for below freezing temperatures to occur in any month with the possible exception of July and August. The Salmon River is a popular white water rafting river in the summertime. Bonner's Ferry has an average temperature range of 34.1 to 83.4 F from April through October. However there may be temperatures of freezing or below in any month. Bonner's Ferry has an elevation of 1,896 feet and is located less than 20 miles as the crow flies from the Canadian border. Average snowfall is 62.1 inches and average rainfall is 21.5 inches annually. Sandpoint has an average temperature range of 33.9 to 81.8 F from April through October. There may be freezing temperatures in any month except July. The elevation is 2,096 feet and Lake Pend Oreille surrounds a portion of Sandpoint. Average snowfall is 70.3 inches and average rainfall is 31.9 inches annually. St. Maries has an average temperature range of 34.1 to 85 F from April through October. The elevation is 2,192 feet and there can be temperatures below freezing in each month of the year. Average snowfall is 49.5 inches and average rainfall is 28.17 inches annually. The St. Joe River flows west from St.Maries through several small lakes and into Lake Couer d' Alene. We homestead at about 2,350 feet elevation in Northern Idaho some 50 miles as the crow flies from Canada. Our garden area is a combination of raised beds, large potted plants and two different Hoop House style Greenhouses. 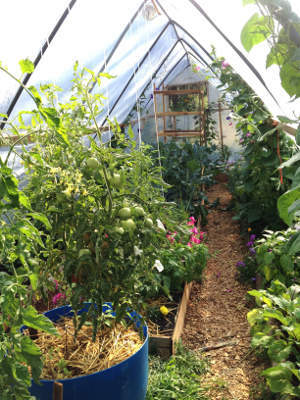 One Hoop House is 7 feet by 12 feet and 8 feet high. It is covered with greenhouse plastic and we call it the Tomato House. It has room for 6 to 8 tomato plants in large pots. It's framework is PVC Pipe and we take the greenhouse plastic off of it during winter time since PVC Pipe is not rated for holding a snow load. It takes less than 30 minutes to completely remove the greenhouse plastic and store it for the winter. It has a door and a window that can be opened up to control the temperature inside. The second Hoop House is 10 feet by 32 feet and 10 feet high. It's framework is made up of PVC conduit. It is covered with greenhouse plastic. Besides a door and a window, it is designed so that the sides can be rolled up half-way when needed to control the temperature inside. This hoop house has withstood winds of over 75 mph without any damage. It has raised beds inside for plants to grow in. The greenhouse plastic is removed and stored during wintertime. This takes about an hour and 15 minutes to disassemble and store the greenhouse plastic. By using the hoop houses we can extend our growing season by 30 days or more each year. The cost of materials for the 2 hoop houses was around $400 total and the greenhouse plastic is good for at least 5 seasons. These hoop houses give us the ability to homestead in the most scenic portion of Idaho and the section of Idaho that has the most water. We cannot conceive of a reason to relocate our homestead to any other area of Idaho or the U.S.
Is Idaho a Homestead State? No western State currently has free land to homestead. However Idaho has a Homestead Law that allows a significant portion of your home and one acre of land to be deducted from Property Taxes and exempt from Court Judgments. You can purchase land in Idaho for a homestead. Modern Homesteading is different in some ways than traditional homesteading. What State Has The Cheapest Land? The real question is not what State has the cheapest land but what State has land with the necessary components for a good homestead. Those components are good supply of water, good soil, decent growing season and trees for a windbreak, to make things out of and to use for heat in the winter. Where is The Best Place to Homestead in Idaho? It would be around Orofino. We are happy with our Homestead in Bonner County about 50 miles as the crow flies from Canada.